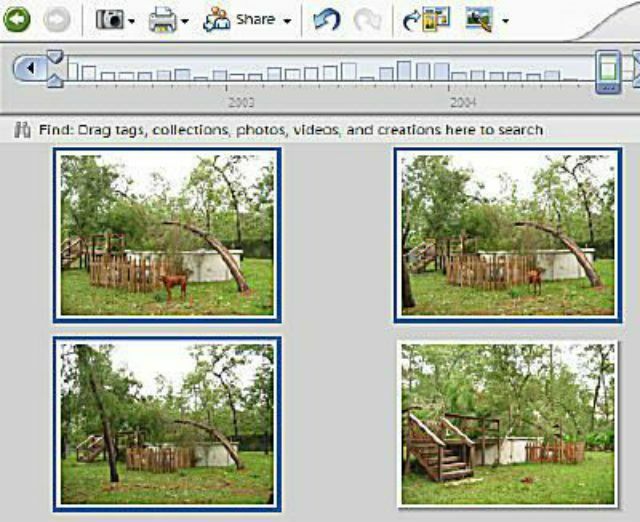 Photo Stacks are a great way to group a series of similar shots so they take up less space in the Photoshop Elements Organizer photo browser window. To create a stack from a group of similar photos, first select each of the photos you want to include in the stack. Right click > Stack > Stack Selected Photos. Right click and go to Stack > Stack selected photos. You can also use the shortcut Ctrl-Alt-S.
Stacked photos in the photo browser. The stacked photos will now appear in the photo browser with a stack icon in the upper right-hand corner (A), and the borders of the thumbnails will appear as a stack (B). Viewing the photos in a stack. To reveal all the photos in a stack, right click on the stack and go to Stack > Reveal photos in stack. You can also use the shortcut Ctrl-Alt-R. Setting the top photo in a stack. While viewing photos in a stack, you can choose which image should be the thumbnail by designating it is the "top" photo. To do this, right-click the photo you wish to set as top-most, and go to Stack > Set as Top Photo. Getting back to where you were. After viewing the photos in a stack, be sure to use the back button instead of the Back to all photos button if you want to return to where you were in the browser. When you no longer want photos in a stack, you can either unstack them or do what Adobe calls flattening the stack. Both of these commands are available from the Edit > Stack submenu. Unstacking removes the stack and leaves all of the stacked photos in your catalog just as they were before. Flattening removes all but the top photo from your catalog, giving you the option to delete from hard disk if desired.